Because we get lots of questions on how to make pickles we decided to share our favorite crispy dill pickle recipe. Crispy dill pickle recipe – the tips and tricks to a crunchy pickle. We love to make our own pickles from our garden cucumbers. But how disappointing when you open a jar and bite into a soft and mushy pickle! So why is it so difficult to get a pickle to become crunchy? There are several reasons. 1. 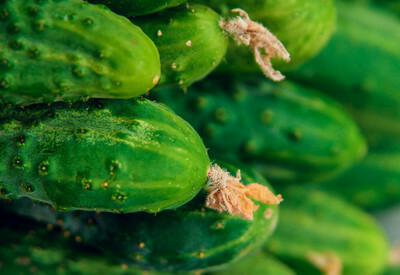 The most important way to avoid mushy pickles is to use fresh picked, pickling cucumbers. Standard garden salad cucumbers are not ideal for making pickles. These cucumbers are too large and contain a thick seed base as compared to pickling cucumbers. You want to make sure to use smaller cucumbers that are made for pickling, such as National Pickling Cucumbers. 2. When picking them out of the garden, look for slim and dark green cucumbers with prickly bumps on the skin. If it has begun to yellow or become overly swollen, it will not make a good pickle – save that one to enjoy as a snack or with a salad. Be sure to cut off the ends of the cucumbers before pickling. 3. Another important tip for crisp dill pickles is to make them within hours of picking. The water in cucumbers begins to evaporate soon after picking, leaving them to soften quickly. And that means soft and mushy pickles. 4. Also, make sure to cut off the blossom end of each cucumber. 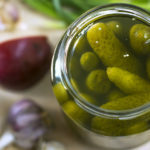 The tip contains an enzyme that can change the overall chemical balance in your pickles causing them to soften when canned. 5. Another possible reason that you might get mushy pickles is by over-processing them. It is best to have your hot water bath close to a boiling point when hot packing your jars so they don’t spend excessive time in the hot water. 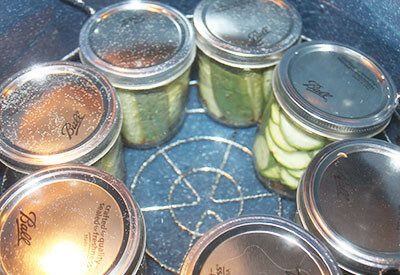 We use the Ball Water Bath Canner and Tool Kit to easily make our pickles. Our secret to our crispy dill pickle recipe – grape leaves. 6. Alum is no longer a recommended additive for canning pickles per the FDA. Alum can still be found on the shelves in the spice aisle or canning section; however, it is no longer approved for canning pickles. 7. 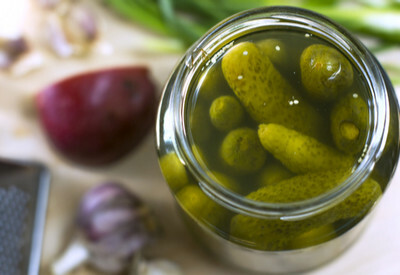 And finally, our secret to crisp dill pickles – adding half of a grape leaf to each jar. This really isn’t a secret, rather an old method that has been passed down from generation to generation. These tannin-rich leaves keep lacto-fermented foods crispy, without negatively affecting the taste of the pickles. For us, it is easy to use grape leaves – we just gather a few from the vineyard, but you can find them by asking neighbors, local vineyards, and of course picking them from wild crops. Pickles in our Ball Water Bath Canner. 1. Prepare jars – wash or sterilize them in the dishwasher – keeping them hot. 2. Start water bath now – you want it close to the boiling point by the time you are ready to add your jars. 3. 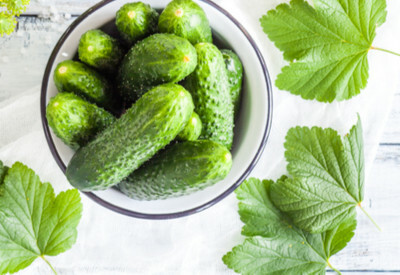 Wash cucumbers – making sure to scrub the skin thoroughly. 4. Cut off each end of the cucumber, and slice, dice or spear as desired. 5. In a medium sauce pan, over medium high heat, bring vinegar, water and salt to a boil. 6. In each jar, add 1 garlic clove, 1 teaspoon of dill seed, and 1/2 teaspoon of peppercorns to the bottom. 7. 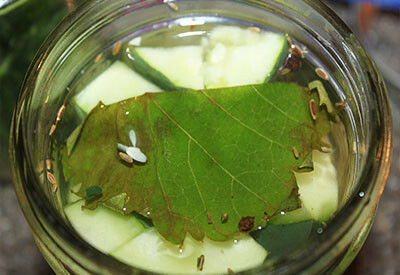 Pack cucumbers tightly into each jar. After adding the brine, place a half of a grape leaf on top. 8. Pour hot brine over cucumbers, leaving 1/4 inch head space at the top of each jar. 9. Run a plastic utensil on the inside of the jar to release any air bubbles. 10. Add 1/2 of a grape leaf on top of the cucumbers. 11. Wipe top of jar with a clean damp cloth, add hot lid and band. 13. Remove jars with a jar lifter and place on a thick towel and let cool at room temperature for 24 hours. After 24 hours, check to make sure the jars are sealed by pressing down on the center of the lid. If it does not ‘pop’ then it is sealed. If you are able to press down on the lid, place in the refrigerator and use within 2 weeks. It is best to wait at least 2 weeks before opening your first jar of pickles — believe me, it’s worth the wait! Prepare jars – wash or sterilize them in the dishwasher – keeping them hot. Start water bath now – you want it close to the boiling point by the time you are ready to add your jars. Wash cucumbers – making sure to scrub the skin thoroughly. Cut off each end of the cucumber, and slice, dice or spear as desired. In a medium sauce pan, over medium high heat, bring vinegar, water and salt to a boil. In each jar, add 1 garlic clove, 1 teaspoon of dill seed, and 1/2 teaspoon of peppercorns to the bottom. Pack cucumbers tightly into each jar. Pour hot brine over cucumbers, leaving 1/4 inch head space at the top of each jar. Run a plastic utensil on the inside of the jar to release any air bubbles. Add 1/2 of a grape leaf on top of the cucumbers. Wipe top of jar with a clean damp cloth, add hot lid and band. Remove jars with a jar lifter and place on a thick towel and let cool at room temperature for 24 hours. The FDA no longer approves the additive. Not sure about the science behind the research but I know my Grandmother used it for years! I am wondering why alum is no longer recommended in canning pickles? I have a 14 day recipe using alum and they are so good!